A spray of blue color on a tree I found near the place I work made for a dynamic photograph. The wind has grown colder the last two weeks or so - the season is changing. Oh wonderful shot!! 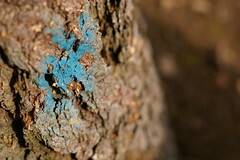 I found some blue green lichen on a tree the other day - seemed out of place - but cool!! So fun to see some of your photos!! Beautiful!! I really like that blue colour!